The problem of Vitamin B12 Malabsorption can be huge. If you have low vitamin b12 levels, you may or may not actually have a problem with malabsorption, but you definitely have a problem that needs Vitamin B12 Deficiency Treatment. We'll discuss the reasons why you might have malabsorption and what you can do about it. Intrinsic factor is a substance that is present in the stomach that allows vitamin B12 to be absorbed. It is the most OBVIOUS reason for vitamin B12 deficiency, but not the most common. 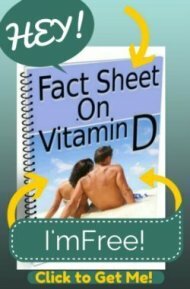 Many doctors, when faced with a case of Low Vitamin B12, but can find nothing else wrong, will 'assume' that the problem is a condition called Pernicious Anemia that is defined by a lack of intrinsic factor to absorb vitamin B12. The H Pylori Bacteria is present in about 50% of the population- and it can cause low vitamin b12 levels. Unfortunately, despite this fact being confirmed in study after study, it has not been accepted by the medical profession who believes that ONLY people with digestive problems and ulcers can have the H Pylori bacteria. 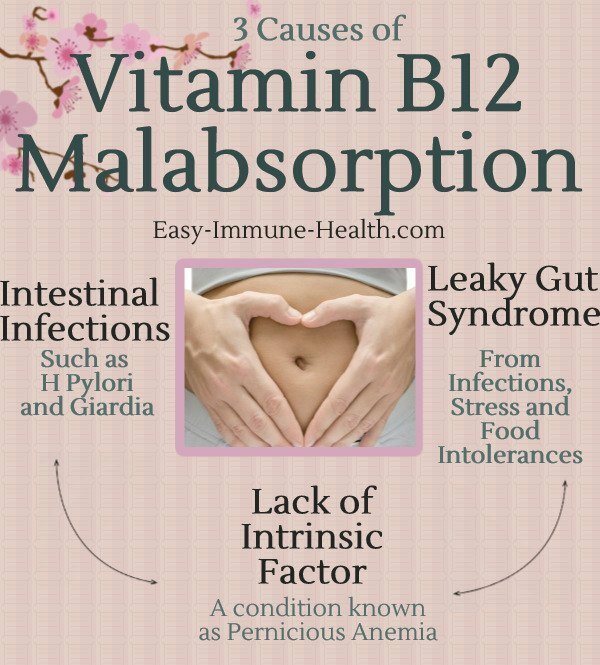 But studies of people who have low vitamin b12 levels showed that the Vitamin B12 malabsorption was actually caused by the damage that the H pylori did to the stomach, causing vitamin B12 not to be absorbed. Those who were treated for H pylori had their vitamin b12 levels go back to normal without any other treatment! The H Pylori Bacteria was the cause of the low Vitamin B12 Levels, and treating the H pylori bacteria resolved the problem of Low Vitamin B12 levels. Unless you have digestive problems like heartburn or ulcers, however, it's unlikely that your doctor will test you for H pylori. Fortunately, you can get an accurate In Home H Pylori Test and test yourself without the help of your doctor. Leaky Gut Syndrome, more correctly known as Increased Intestinal Permeability, is probably the most common reason for Vitamin B12 Malabsorption. It's a condition that can exist for several reasons, including intestinal infections such as H Pylori and severe life threatening accidents, but one of the main causes is Gluten Sensitivity. Gluten Sensitivity is another EXTREMELY common, but almost entirely overlooked, reason to have B12 Malabsorption. In fact, gluten sensitivity or Celiac Disease is probably The most common reason to have decreased vitamin B12 levels, but again, doctors simply will NOT test for this or recommend a Gluten Intolerance Diet unless you have digestive problems. This is despite the evidence that a LARGE percentage of people with gluten sensitivity absolutely do NOT have digestive complaints. Unfortunately, even if your doctor does test you for it, Diagnosing Gluten Sensitivity is tricky and very often inaccurate. This leaves large numbers of people who have tested Negative for Celiac Disease believing that they can continue to eat gluten without problems. 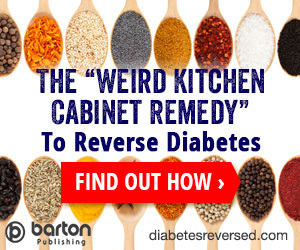 But if you have Vitamin B12 malabsorption and have tested negative for Celiac Disease, there is still an excellent possibility that you have Non Celiac Gluten Intolerance and potentially remedy your problem on a gluten free diet. 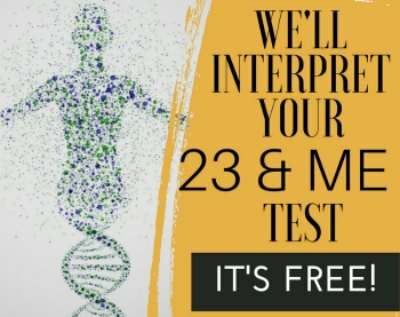 The MTHFR Genetic Mutation sounds like some crazy thing that only mutants would have, but it's actually rather common, and as awareness grows, it's being increasingly implicated in health problems such as breast cancer, autism and chronic fatigue; it's also being increasingly identified by simple tests that can even be done at home and sent back to the lab. The MTHFR Genetic Mutation is interesting because blood testing will actually show normal or high levels of Vitamin B12 in the blood because the mutation simply does not allow Vitamin B12 to be absorbed into the tissues, but it remains in the blood. The same occurs with the nutrient called folic acid. This mutation is a problem, not only because it does not absorb vitamin B12, but because it prevents the body from detoxifying substances. The solution to this problem is to eliminate all synthetic forms of Vitamin B12 and folic acid, and use the 'methyl' forms of these vitamins that come in the forms of Methylcobalamin B12 and Methyltetrafolate. The body can absorb these forms, and it provides the needed 'Methyl donor' required for proper detoxification. Methylcobalamin B12 Supplements are the 'right' kind of B12 for MTHFR genetic mutations. If you have been diagnosed with low vitamin b12 levels and potentially have Vitamin B12 Malabsorption then the MOST likely problems that you have are H Pylori infection, gluten sensitivity, the MTHFR Gene, or all three- even if your doctor denies that any of these could be a problem. You also might have low stomach acid levels from taking Acid Reflux Medication. 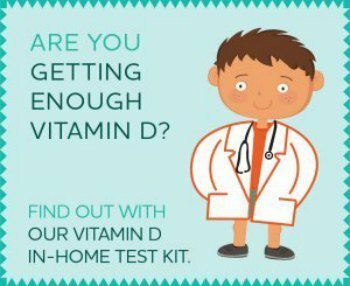 The most commonly diagnosed Cause of Vitamin B12 Deficiency, Pernicious Anemia, is actually the LEAST common of these problems- and you do NOT need Vitamin B12 Shots for it. If you have Low B12, no matter what the reason, you can simply take Sublingual Methylcobalamin Vitamin B12 Supplements. If you have HIGH or normal levels of Vitamin B12 but have the classic symptoms of a Vitamin B12 Deficiency, then you may have the MTHFR genetic mutation, and might consider getting a simple test for it. Tip #1: SEARCH THE SITE FIRST! USE THE SEARCH BOX IN THE TOP RIGHT OF EVERY PAGE. 99% of all questions have been answered already. I will just delete your question if it's been answered already. Tip #2: INCLUDE YOUR EMAIL ADDRESS on the Confirmation Page. There is no other way for you to get the answer to your question! Tip #4: Include a DESCRIPTIVE TITLE that tells about your problem. Saying 'Help Me' or something similarly nondescriptive does not help me to know what the problem is. A title such as "My _______ Level is Not Coming Up" is much more helpful. Tip #5: If you are on a mobile device, please recheck your spelling and grammar. Tip #6: Use decent grammar and complete sentences. Most of you are adults who went through over a decade of some sort of compulsory education. Please at least make your questions understandable. If you are not a native English speaker, just do your best. Tip #7: SEARCH THE SITE FIRST! USE THE SEARCH BOX IN THE TOP RIGHT OF EVERY PAGE. 99% of all questions have been answered already. Remember: INCLUDE YOUR EMAIL ADDRESS on the CONFIRMATION PAGE (next). There is no other way to get the answer to your question!! Your picture must be smaller than 800x600 pixels. If it's larger, then you'll have to resize it before you are able to upload it. You must put your Email Address ON THE CONFIRMATION PAGE AFTER YOU ENTER YOUR QUESTION. There is no other way for you to get your answer. DID YOU FIRST SEARCH FOR YOUR ANSWER ON THE SITE? 99% OF ALL QUESTIONS PEOPLE HAVE HAVE BEEN ANSWERED ALREADY.